Angela and Juan Sebastian are siblings who were only kids when Lenin last paraglided in Sopó, but now they are running one of the biggest paragliding schools around Bogotá. We stayed with them for two nights, and Churro quickly made friends with their dog, Apollo, a beautiful Rhodesian Ridgeback about three times his size. 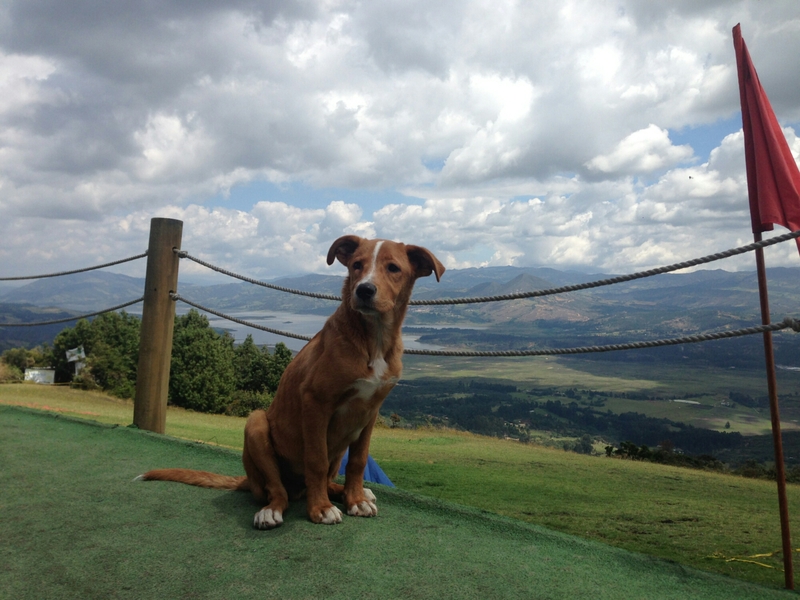 Churro waits patiently for the wind to pick up at the paragliding school. ​We spent one full day in Sopó, hiking up to the paragliding school, waiting for wind that never came, and then hiking back down, accompanied by both dogs. On the way down, we opted to take a trail that was closed, but a policeman told us how to get there anyway. The trail was tough, and at one point became very steep and rocky. The dogs had trouble in a few spots, but we managed to coerce them down all of the tough areas until one part that involved a vertical drop of maybe six feet from a rock. I climbed down first, and Lenin was able to pass Churro to me, whom I safely transferred to the ground, but Apollo was too big to carry and wanted no part of it. He started running back up the mountain. Churro and I waited patiently for what seemed like over an hour while Lenin chased after Apollo. Apollo was very intent on not being forced down the trail, and he actually hid from Lenin in the bushes, holding his breath so that Lenin couldn’t find him. Lenin eventually succeeded in capturing Apollo, dragging him down towards me with his leash. Before he could make it to the difficult section, Apollo made another attempt to escape, this time breaking his leash, rendering it useless. 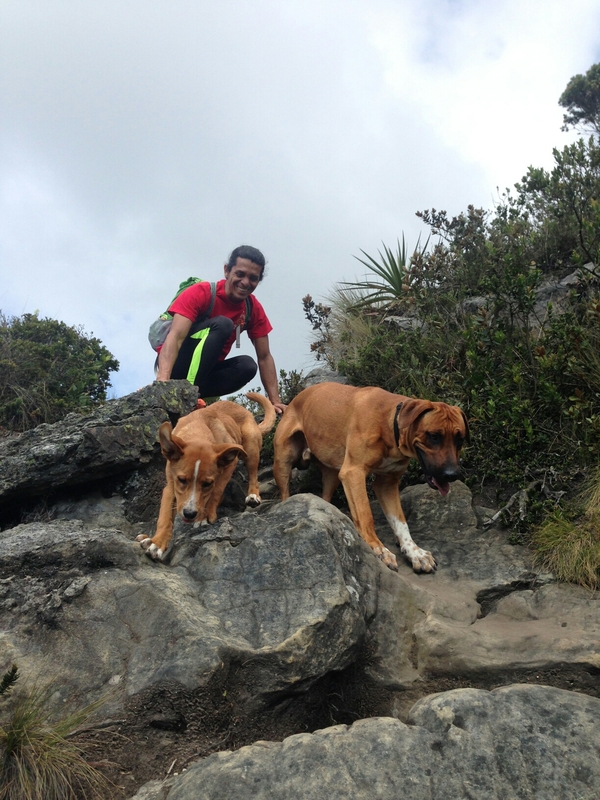 Churro and Apollo carefully climb down the mountain, followed by Lenin. ​We had been hiking down for over an hour on this trail, having already traversed several tricky spots for the dogs, and to go back up to the road that we had walked up on would take a few more hours. We didn’t have enough daylight for that, and we were almost back down. We were starving, thirst, dizzy, and frustrated with the stubborn dog. It seemed ridiculous to climb back up the mountain only to go down again a different way, but both Lenin and I were considering that that might be our only option. Lenin went back up to look for Apollo, but he had no way of pulling him down so asked me to get Churro’s leash. Churro was napping with our backpack in a shady spot a bit further down the trail, so I went down to fetch his leash. On my way down, I heard some rustling in the bushes not far from the trail. There was an animal making its way through the vegetation towards me, but I couldn’t see what it was. Lenin was still high above us, trying to figure out where Apollo had gone, when suddenly out he came from the brush just below me and Churro on the trail! Lenin was moved by Apollo’s intelligence, remarking on how smart he was for the rest of our time in Sopó. Churro’s first motorcycle ride went very smoothly, and he seemed to enjoy it! 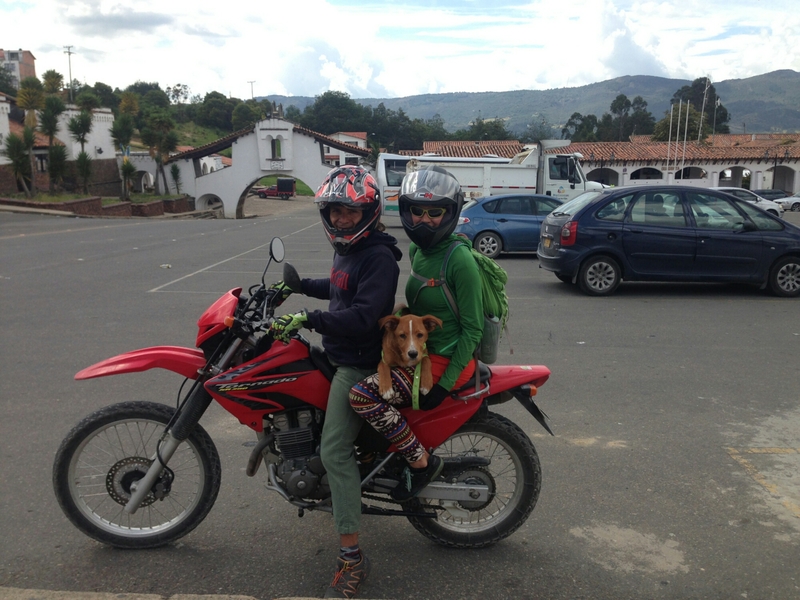 ​The next day we borrowed Juan Sebastian’s motorcycle to get to Guatavita, a small town just across the lake on the other side of the mountain. This was Churro’s first experience riding a motorcycle, and he seemed to enjoy the wind on his face as he scrambled to get a better position between me and Lenin, resting his head on Lenin’s shoulder. I enjoyed watching him, with his jowls flapping in the breeze, though his nose was running, and mucous was flying back onto my arm. From Guatavita we went up another mountain to get to the Laguna de Guatavita, where the legend of El Dorado originated. In this laguna, the indigenous leaders would go with all their offerings to the gods, filling a boat with gold, paddling to the middle of the deep lake, and dropping all the gold into the water. We should have done more research before going though, because the laguna was closed when we arrived. It would have been about an hour’s hike to the lake each way, and we still had to bike to Bogotá that afternoon, so perhaps it’s better that we didn’t go. Instead, we went back to Guatavita for lunch and back to the house in Sopó to pack our bicycles and leave. The ride out of Tunja was tough at first, climbing up and over the mountains. Juan Manuel had warned us that the first half of the ride would be rolling hills after a long 7km climb out of town. Lenin and I were tired, and Churro was heavy, but I felt there was too much traffic for him to be running at the beginning, and we had a long ride ahead of us still. We let Churro run when the hills are more difficult to climb, but since he’s still a puppy and his bones are still growing we are trying not to let him run too much. Over the past few days, I think Churro has come to appreciate his ride and all the extra work that Lenin and I are doing to pull him along. He is usually restless in the morning, so when there’s not much traffic and we are going slowly up a hill, he runs. And he is usually very good about staying on the right side of the road, keeping our bikes between him and the travel lane. Only when we encounter other animals do we need to worry about him, because then his fear of the other dog or cow or goat on the grass makes him forget that there are cars on the pavement. We quickly learned to corral him into his trailer when we see an animal ahead, and he has quickly learned to feel comfortable going into the trailer when we ask him. It has become his safe zone, where he feels untouchable to the other animals. This skull on the side of the road was just the omen I didn’t need during the miles that Lenin and I rode separately, in silent anger. Lenin wanted Churro to run as we left Tunja, but I thought he should be in the trailer until we got further outside of town. We had been switching bikes every 10 kilometers to share the duty of pulling the trailer, but since Lenin was pulling the trailer at the time, he felt that I wasn’t considering him when I asked for Churro to take a ride. We argued about this until Lenin agreed to put Churro in his trailer, and then we rode separately without speaking to one another for the next 20 kilometers. The down side to traveling with someone for so long is the arguments that get blown out of proportion over stupid disagreements. The benefit to traveling by bicycle is that pedaling helps to burn off anger, and it’s hard to stay angry when you’re outside, on a bicycle, exploring a beautiful country. ​We eventually stopped and calmed down at a park commemorating the battle where Simon Bolivar won independence for Colombia from Spain. The road between Tunja and Bogotá is nicely paved, with wide shoulders and very little debris or bumps, making for an enjoyable ride. We made several stops for snacks, and while sharing some treats on the side of the road, Lenin found someone’s wallet complete with their personal documents. He packed that into the trailer to try to contact the person when we had internet access. We had to pedal over 100 kilometers just to get to the road to Sopó, and it was dark when we reached it. We made one last stop for food at that junction, and then rode the last 5 kilometers into Sopó, which is a playground for rich people who live and work in Bogotá. It is also the home of Alpina, one of the two major dairy manufacturers in Colombia. Lenin used to come here every weekend to go paragliding, and we had a place to stay with his friends who owned one of the paragliding companies.